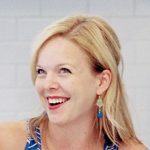 When I first began learning to cook, back in my college apartment with a couple of random cookbooks and a few recipes printed from the interwebs, I was aaaallll about pasta. I’d venture a guess that pasta was one of the first foods many of us prepared beyond cereal or popcorn. Plus, I knew I loved it. Who doesn’t love pasta? As my interest in cooking has grown, I’ve steered away from pasta a bit. We still love it and eat it at least once every couple of weeks, but in many ways I started to equate it with something like a sandwich. In the same way you can put pretty much anything between two slices of bread and call it a meal, so too can you throw random ingredients into your pasta dish and call it dinner. While some nights that sort of adaptability and easy approach is a necessity, on others I just want something a little bit different. 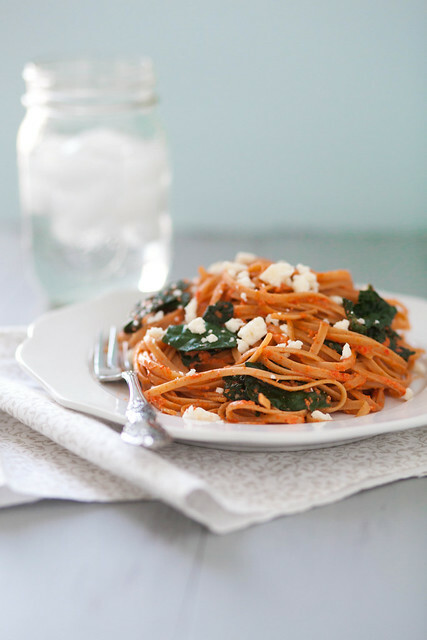 I love this pasta with roasted red pepper sauce, kale and feta because it is exactly that…just a bit different. It’s different enough from the typical thrown together pasta jumble that it gets me jazzed about pasta again. Actually, our whole family is pretty nuts over this dinner and the kids always ask for seconds. The salty feta is a wonderful complement to the slightly sweet roasted red pepper sauce. The kale rounds out the flavor profile and contributes a healthy dose of vitamins and nutrients. If you use whole wheat pasta, as we do, this is quite a healthy meal. And bonus, this makes great leftovers! Preheat the broiler (or preheat the oven to 500˚ F if you do not have a broiler). Place the peppers in a baking dish or on a rimmed baking sheet. Transfer to the oven and broil/bake, turning occasionally, until all sides of the peppers are charred and the skins are bubbling, about 20-25 minutes. Transfer the roasted peppers to a bowl, cover, and let rest approximately 15-20 minutes. Meanwhile, bring a large pot of water to boil. Cook the pasta according to package directions until al dente. Place a colander in the sink and add the chopped kale to the colander. When the pasta is finished cooking, reserve ½ cup of the pasta water, then drain the pasta in the prepared colander so that the hot water wilts the kale. Return the pasta and the kale to the pot. Meanwhile, remove the peppers to a cutting board, peel away the skins and discard. Deseed the peppers, give them a coarse chop, and transfer to the bowl of a food processor or blender). Add in the olive oil, walnuts, salt, red pepper flakes, and garlic to the food processor. Process the mixture until completely smooth. Taste and adjust seasonings as necessary. Add the sauce to the pot with the pasta and kale and toss well to coat in the sauce, stirring in a splash of pasta water at a time as needed to adjust the consistency. Stir in a handful of feta crumbles. Serve warm, topped with additional crumbled feta if desired. *You can use jarred roasted red peppers if you prefer. A 12 oz. jar should be fine.